The Clark Masts QT /P & /PX Air Operated portable mast series are a heavier duty version of the standard QT Series and offer particularly easy hand rotation and locking of the the headload after mast extension. Their heavy duty construction and, especially their heavy duty locking collars, provide for vertical headload capabilities from 10 to 30 Kg. Extended heights of from 2.92 to 10 metres make the Clark Masts QT /P and /PX portable masts especially suited to the rigors of lighting and other applications where medium duty directional headloads are required to be lifted by cost effective, rapidly deployed air-operated portable masts. 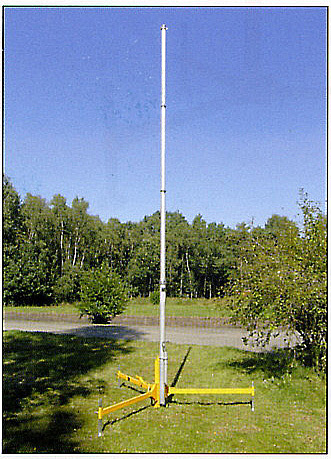 Shown above is a Clark Masts QT PX4/1, 5.6 metre portable mast on a PX Tripod. The Clark Masts QTM portable lightweight air-operated portable telescopic mast series was first introduced back in 1959 (Australia saw it in the early 1960's courtesy of a company called Belling-Lee and the foresight of a gentleman working for them at the time, Frank Welsh). In 1959, father of the Clark Mast, Alec Clark (who has only just recently retired from the company) foresaw the need, in addition to their 1957 introduced PT Series, for an easily handled lightweight portable mast and designed the QTM Portable Mast Series. Today the Clark Masts QTM portable masts series has become two, the standard QT Series and the heavier duty QT /P & /PX Series shown on this page. The distinguishing feature of both the Clark Masts standard QT portable telescopic masts and QT/P/PX telescopic portable masts are their air-operation and side attached handpump. This method of extension makes the Clark Masts QT mast self contained, lightweight, easy and rapid to extend and very gentle in retraction. Heavy duty Locking Collars on each Clark Masts QT /P and /PX mast section allow sections to be locked together at any extension height, making the portable mast usable over a variable height range or alternatively locked at maximum height for long periods of time when the air supply may be removed. All Clark Masts QT /P & /PX portable masts have the advantage of allowing their headload to be easily turned after the collars have been locked. Clark Masts QT/P & /PX series portable masts are used for lifting, from 2.92 to 10 metres, medium weight (up to 30 Kg) , lights, antennas, video and still cameras, sound measurement, air pollution monitoring equipment and a great deal of other apparatus which has directional and/or medium lift requirements. Clark Masts QT/P & /PX series portable masts may be used un-guyed under wind conditions of 24 to 128 Km/hr, depending on the mast type. Clark Masts QT/P & /PX series portable masts are supplied with three way guy collars already fixed at the most appropriate height. All Clark Masts QT /P & /PX portable telescopic masts are rated at a wind speed of 128 Km/hr when guyed. A 24 mm Clamp Collar Socket, that tightly clamps the spigot of the headload to the mast and releases instantly when required, is fitted to all Clark Masts QT/P & PX masts. 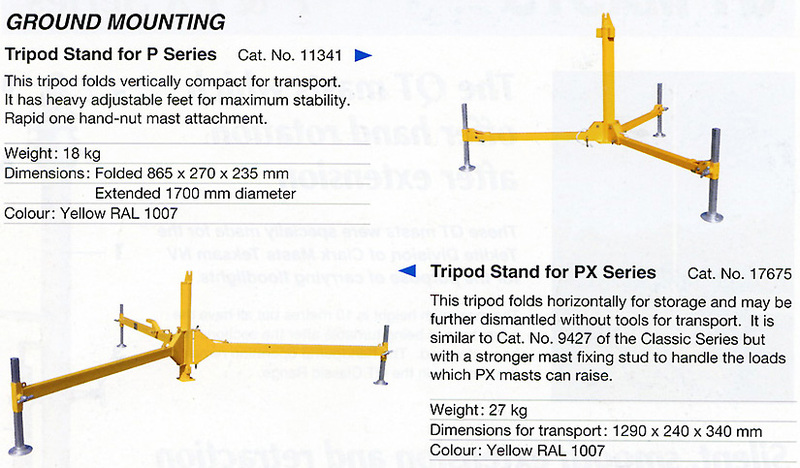 There is also a full range of Clark Masts QT mast Accessories available from Australian Portable Masts Australia Pty Ltd, including the free standing tripod like that shown above, as well as guy assemblies & guy pickets for use in strong winds, weather covers and vehicle mounting and shelter attachment brackets. Clark Masts QT/P & /PX series portable masts may also be extended using air sources other than the hand pump supplied. For example Clark Masts have available 12 and 24 volt DC as well as 230 volt AC operated Air Source/Mast Control units as well as adaptors for allowing the use of a truck's air supply. Details on alternate air supply equipment may be found here. Below are shown Clark Masts QT/P & /PX series portable mast specifications. Masts with extended heights from 2.92 to 10 metres are available in the QT /P and /PX series for use in applications from emergency portable lighting (see Clark's Teklite Masts where specialist Emergency Portable Lighting Masts are required) to portable communications and aerial photography. 1. Aluminium Alloy Tubular Sections. 2. Handpump provides fast erection times. 3. Mast Mounting Studs, M8 on /P Series & M10 on /PX Series (also stud under mast base [Bottom Mounting Pin] on 'P Series). 4. Water-drain Plug (PX), Bottom Mounting Pin (P). 6. 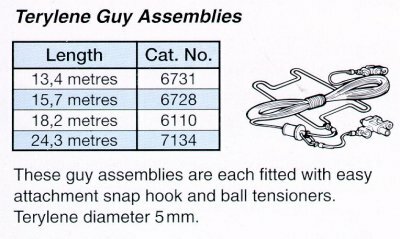 Section-clamping Screws and Mast Collar. 8. Quick Clamp with 24 mm socket for Headload attachment.